Dr. Amie Maciszewski is an internationally acclaimed sitarist, teaching artist, educator, and ethnomusicologist. 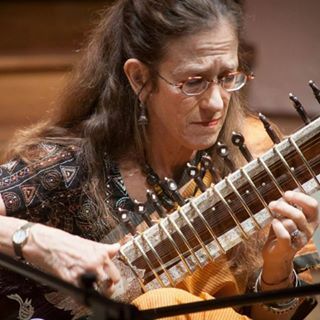 Her training includes both formal academic study (B.Mus., gold medalist; M.Mus., merit scholar - sitar, Viswa-Bharati University, Santiniketan, India) and traditional immersion mentorship in India, a Ph.D. in ethnomusicology (UTexas/Austin), a postdoctoral fellowship (University of Alberta), and ongoing traditional study with two legendary gurus: Grammy-nominated sarode Maestro Aashish Khan and the late Hindustani vocal diva Padmavibhushan Girija Devi. Deeply committed to sharing the music culture of South Asia, Amie has performed in concerts, completed residencies, and conducted all-ages workshops throughout North America, in the UK, Europe, India, Pakistan, and Japan. She has published numerous scholarly articles in journals and books and produced-directed three documentary films on socially marginalized musicians, two of them award-winning. She has taught at the Universities of Texas, Alberta, and Pittsburgh; and completed artist-scholar residencies at the Universities of Colorado, Chicago, Louisiana State, Sangeet Research Academy (SRA - Kolkata, India), and National Academy for Performing Arts (NAPA - Karachi, Pakistan). Amie has received multiple awards for her scholarship, teaching, outreach, and performance in India, the US, Canada, and Pakistan. She is a juried artist on the Texas Commission on the Arts (TCA) Touring Roster and Mid-America Arts Alliance (M-AAA), and Empaneled Artist of the India World Cultural Forum (IWCF). She was a City of Austin Cultural Contractor (2000-13), Visiting Musician-Researcher at ITC-Sangeet Research Academy/Kolkata (2011-2015), and New Mexico Arts Division Artist-in-Residence (1986-91). She was awarded the Gandharva Puroshkar 2014 by Hindustan Art and Music Society (Burdwan, India) for her contributions to Indian music abroad. In 2016 she was selected by the US Consulate/Lahore, Pakistan, Public Affairs Office, in association with the Fulbright-Hayes Commission, to complete a cultural diplomacy tour of Lahore and Islamabad as a sitar performer and teaching artist, during which she received an award from the Lahore/Mozang Rotary Club for using her music as a tool for peace across borders. She has been awarded grants from the City of Dallas Office of Cultural Affairs in 2017 and 2018 to support her artistic projects. In 2018, she was a member of a team awarded a grant by the American Institute of Pakistan Studies to conduct workshops on social science research methodology and curriculum development in Lahore, Khanaspur (KPK), Islamabad, and Rawalpindi for Higher Education Commission (HEC) participants; and music performance and instruction at National Academy for Performing Arts (NAPA) in Karachi. Her Sangeet Millennium Ensemble (Austin Chronicle Texas Top Ten award, 2008, 2011), seamlessly blends traditional Indian melodies with jazz/world grooves, creating a dynamic, boundary defying sound. The ensemble has released three CDs; in addition, Amie has released two CDs featuring her classical sitar with tabla accompaniment and has produced her late Guru Padma Vibhushan Girija Devi's live CD in which Amie appears as backup vocalist. I love AMOC because it's a beautiful, sacred creative space that's practically in my backyard! I also love all the love and support you folks give us aspiring Big Magicians!